Millet Breakfast Recipes Indian made? 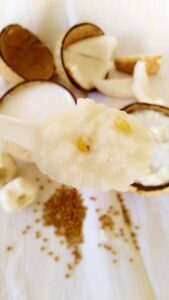 Try Millet Coconut Milk porridge! Out of all the millet breakfast recipes Indian loves, Millet Coconut Milk Porridge is the best. A simple dish loved by all ages, the flavor of garlic, fenugreek and coconut milk gives a wonderful flavor to the dish. For kids, it’s supposed to be a healthy breakfast and for adults too it has lots of medicinal benefits. 2. Take first n second milk from fresh coconut and keep aside. 3. In a cooked add rice, water, soaked fenugreek, garlic and cook till soft. 5. Once the cooker cools down, mash the rice well. 6. Add salt and coconut milk n mix well without lumps. 1. 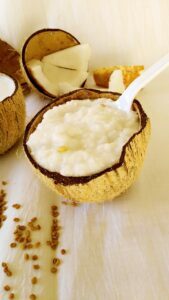 Mix coconut milk only before you serve, don’t do it earlier it will affect the taste of the porridge. 4. For the first time try it with plain rice you will get an idea. Kalaimathi Rajesh is an optimistic person and a mom of two lovely kids who love cooking, baking, art, and dance. She loves to experiment in her kitchen and share recipes with everyone. She loves cooking and baking which has proven to be a great stress buster for her. Now, enjoy our millet coconut milk porridge – the best of all millet breakfast recipes Indian style. Put your queries on comments or show some love for us by sharing, if you liked it! Also, find some time to check out our readers favorite Green Moong Dal recipe.